Do You Have Daily Departure Sessions? What Is The Difference Between The Sunset Dinner Cruise And The KK City Night Dinner Cruise? Both cruise sessions provide an international buffet dinner spread and live entertainment. While the Sunset Dinner Cruise highlights Sabah’s beautiful sunsets, the KK City Night Dinner Cruise offers a stunning view of Kota Kinabalu’s skyline - each creating its own unique dining experience! What Is Malaysian Rate, And Why Is There Malaysian Rate? Who Is Eligible For It? Like any other country, locals will always have citizenship privileges. Thus, our Malaysian Rates are eligible for all Malaysians from East and West Malaysia. MYKAD will be required for verification of identity upon registration prior to boarding. I’m Interested In Your Cruise. How Do I Make A Booking? ONLINE BOOKING : Once you have decided on the cruise package, you can immediately proceed to book the tour online and make payment via credit card. Your Booking Confirmation, Tour Itinerary, and E-Ticket Vouchers will be immediately ready for your download upon payment. EMAIL BOOKING : If you have any queries, feel free to call our hotline +6018 666 2009 or email us at info@northborneocruises.com. Do I Need To Book In Advance Or I Can Book Directly At The Jetty Before The Cruise Departure? We highly recommend for you to book your North Borneo Cruises tour ticket in advance, as our daily departures sell fast daily! We do also accept walk in bookings, but it is subject to seat availability. How Do I Make Payment For The Booking? Can I Make Payment When I Arrive At The Cruise? We require advance full payment in order to confirm your seats for the cruise session. If we have not received full payment before the cruise departure, we reserve the right to release any bookings. Does The Price Include Insurance? If So, What Is The Coverage? Yes, the price includes public liability insurance. However, we strongly recommend you to purchase a comprehensive Personal Travel Insurance policy immediately in your country for the duration of your trip in Sabah, Malaysia; to cover against Personal Accident, Loss of baggage, Delays, Unexpected alterations to travel arrangements, Cancellation, Act of God, Emergency Medical Evacuation, Infectious diseases, Epidemics, Terrorism, and more. Can The Cruise Session Still Proceed If It Is Raining? Yes! North Borneo Cruises will operate even if it is raining, as it is a sheltered cruise with an air-conditioned restaurant. However, if sea conditions are extreme at the time of cruise departure and the Marine Department deems it unsafe conditions for cruising, a full refund will be provided. Should weather predictions be such that a cruise session is not permitted at all, we will inform you in advance. 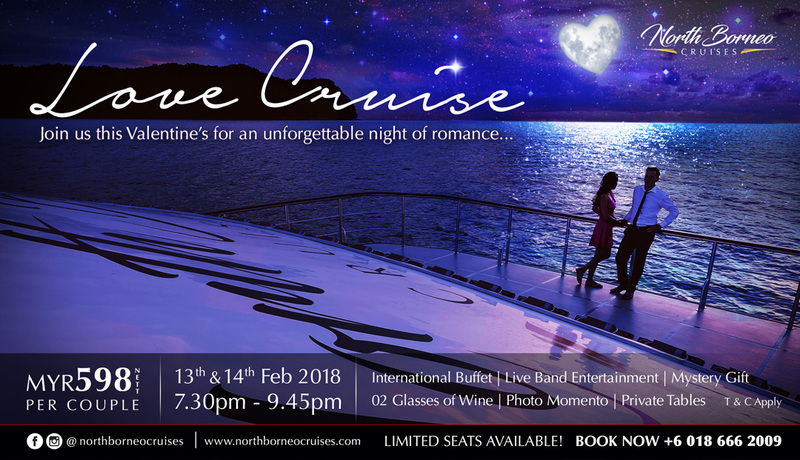 Will I Receive A Refund If I Decide Not To Proceed With The Cruise Session Due To Weather Concerns, Even Though North Borneo Cruises Will Be Cruising For That Session? Only if you have purchased our “Rain Check Flexi" Cover, you will get a refund for your North Borneo Cruises tour ticket in case of bad weather (excluding “Rain Check Flexi” Cover Fee). You will receive the refund within 14 - 28 working days after the cancellation of your tour. Alternatively, we encourage you to purchase the “Rain Check Basic” Cover which allows you to reschedule your North Borneo Cruises tour to another date, 2 hours prior to the boarding time if you are uncomfortable to proceed based on unfavourable weather forecasts. If you have NOT purchased either of the above mentioned covers, there will be NO refund should you decide not to proceed with the North Borneo Cruises tour. As with airline seats, there are no refunds should you wish to cancel your cruise tour - unless you have purchased the “Rain Check Basic” or the “Rain Check Flexi cover.” The "Rain Check Flexi" cover guarantees you a refund should you be unable to proceed with the cruise due to a valid reason such as bad weather or flight delays. You will receive the refund within 14-28 working days after the cancellation of your tour. What Is The Rain Check Basic Cover? What Is The Rain Check Flexi Cover? Can We Postpone Our Date If We Are Suddenly Unable To Make It Due To Valid Reasons Such As Flight Delays, Sickness, Etc? In the event that you have to postpone your North Borneo Cruises tour for valid reasons, kindly provide us with the supporting documents at least 2-3 days before the tour and we will rearrange your schedule for you. Last minute requests to postpone your North Borneo Cruises tour (on the day of tour itself) will incur a postponement fee. Once again, you are advised to purchase the “Rain Check Flexi” cover to ensure receiving a full refund should you be unable to postpone your tour. What Is The Cruise Route For The Daily Departure Sessions? The Daily Departure cruise route will circle along the Tungku Abdul Rahman Park islands and along the Kota Kinabalu City Waterfront. What is the easiest way to get to the Departure Point? If you are in Kota Kinabalu city, a 10 minutes’ drive will take you to Sutera Harbour depending on the traffic. If you are at the airport, the ride will last for approximately 20 minutes. If you are not familiar with Kota Kinabalu City, navigate your way to Sutera Harbour Resort. Do You Provide Hotel Pick Up And Drop Off Services? Yes, we are able to include return hotel transfers from Kota Kinabalu City / Kota Kinabalu International Airport to the Sutera Marina Jetty. The return transfers are chargeable. Where Is The Departure Point For The Cruise? North Borneo Cruises departs from Sutera Marina Jetty. Who Should I Contact When I Arrive At The Jetty? We will provide you with directions to the Registration & Boarding Point of the North Borneo Cruises. In case you are lost or require further help, you may contact our North Borneo Cruises Operations Hotlines +6016 880 2009 / +6012 836 2009. Do You Provide Special Arrangements For Birthdays Or Anniversary Celebrations? For birthdays & anniversary celebrations, we provide a complimentary slice of cake. We also can provide additional customized arrangements such as whole cake orders, flowers bouquet, balloons decoration, and more at reasonable rates. Yes, our restaurant food is prepared and handled in a Halal-certified kitchen. However, North Borneo Cruises does not have a halal certificate as we serve alcoholic beverages on board. What Type Of Food Do You Serve On Board The Cruise? During our daily departure sessions, we provide a full international buffet dinner spread including Chinese, Western, Japanese, and Malay cuisines. I Have Special Dietary Requirements. Do You Cater To Vegetarians? Yes we do. If you have informed us earlier (at least 1 day in advance), we can arrange for a vegetarian meal set for you. For last minute dietary requests, we are unable to cater special arrangements but you may choose the dishes that you are comfortable to eat from the main buffet dinner spread. Can I Still Take Food From The Main Buffet Table If I Have The Vegetarian Meal Set? Yes, you may also partake of the dishes which you are comfortable to eat. Do You Sell Alcohol On Board? Yes we do. We offer beer and wine at reasonable rates starting from RM15/can of beer (Heineken/Guiness/Tiger) and RM20/glass of House Pour Wine (Red/White). Can I Bring My Own Alcohol On Board? If Yes, How Much Are The Corkage Fees? You are not allowed to bring your own alcohol onboard for the Daily Departure Sessions, as we already serve in-house drinks. Does The Corkage Fees Include Mixers? No, the corkage fees do not include mixers. However, we do offer soft drinks and juices on board which can be ordered ala carte. Can I Bring My Own Mixers? No, since we offer mixer drinks on board, you may purchase from us directly if you need it. What Kind Of Live Band Performances Is There? Our resident band offers daily stellar live musical performances and genres in different languages as you enjoy a savory dinner. Expect to be dancing around the tables with a traditional local song and be entertained with upbeat tunes of pop music culture. These guys really know how to complete the atmosphere for a fun and entertaining night out. Oh... and they do accept song requests by the way. Do You Have Karaoke Facilities On Board? Yes, our VIP Room is equipped with karaoke facilities. The VIP Room can hold up to 20 people comfortably and is suitable for small private gatherings. Would It Be Bumpy On Board If It Is Raining? In the event of bumpy sea conditions, the cruise route will be altered to cruise along the coastline of Kota Kinabalu without going into open sea waters. Any route changes are for the comfort of our passengers. I Am Pregnant. Can I Still Go For The North Borneo Cruises Tour? Yes, as it is a relaxing 2-hours leisure cruise along the shorelines of Kota Kinabalu city, there are no issues for you to go onboard the North Borneo Cruises. However, please inform our staff beforehand so that we are aware of your situation. We also highly recommend that you consult your doctor before traveling at any point in your pregnancy. Is There Any Age Restrictions To Join The Cruise? Is It Safe For Elderly? There is no minimum or maximum age limit to go onboard the cruise. It is very safe as long as all safety procedures are adhere to. Children (11 years and below) have to be accompanied by an adult at all times. Are We Allowed To Jump Directly From The Cruise Into The Sea? Jumping from the North Borneo Cruises into the sea is STRICTLY not permitted at any time of the daily departure session. I Am Prone To Seasickness. Can I Still Go On Board? As the cruise is large and stable, any rocking motions will be greatly minimized. however, it will help if you spend more time on the Sun deck enjoying the fresh breeze and open views during the cruise session. We also sell sea sick bands at the bar counter should you wish to purchase any. If you are very prone to seasickness, we suggest for you to take seasickness pills 30 minutes before departure. Please note that we do not distribute medicine of any kind on board for safety precaution, as we do not know whether you may be allergic to a particular drug. Is The North Borneo Cruises Wheel-Chair / Stroller Friendly? Yes, those in wheelchairs or baby strollers can board our cruise via the ramp. Please highlight to us in advance for any special requests regarding this. Children (11 years and below) are to be supervised by an adult at all times.